PLANTS: Annuals to 50 cm tall; stems erect and little branched, with short recurved hairs at least near apex. LEAVES: thin, ovate to elliptic, 2-6.5 cm long, 1.5-4 cm wide, glabrate; apex and base obtuse to rounded; margin serrate; petioles about as long as the blade, with pubescence like the stems. SPIKES: axillary, solitary or paired, fairly open, 1-7 cm long, pistillate near the base and staminate above; bracts subtending pistillate flowers 2-6 per spike, almost round, to 1 cm long in fruit, with 13-18 small obtuse teeth, glabrous except for sparse hairs on the veins and margins; staminate portion 0.5-1 em long, separated from the pistillate portion by a short peduncle, often abortive. ALLOMORPHIC FLOWERS: pedicelled; ovary l-celled, obovoid, hispid, with two fringed wings near the apex. FRUITS: ca. 2 mm long, short pilose. SEEDS: ca. 1.5 mm long, finely pitted. NOTES: Pine-oak woodland, Chiricahua Mts. : Cochise Co.; 1600 m (5300 ft); Sep; native to the Old World tropics (Afr., Asia), introduced to Mex., C. Amer. 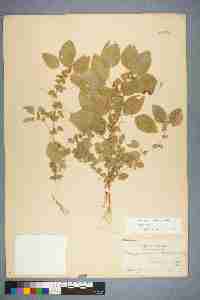 Collected near Paradise in 1907 but not since, suggesting that it did not become established. REFERENCES: Levin, Geoffrey A. Euphorbiaceae. Part 1. Acalypha and Cnidoscolus. J. Ariz. - Nev. Acad. Sci. 29(1): 18.